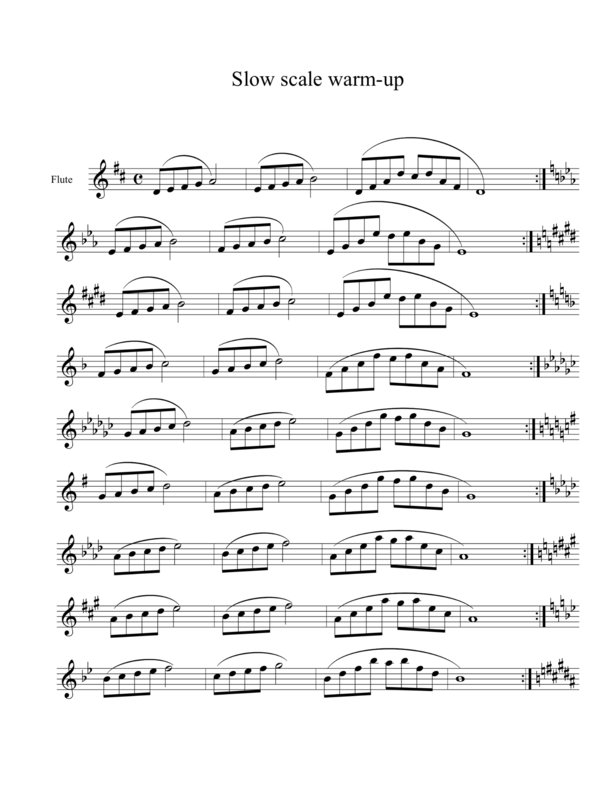 We have spent a great deal of virtual ink on this blog exploring flute embouchure, articulation, intonation, technique, dynamics and vibrato. While all of these things are essential to good flute playing, we’re overlooking the elephant in the room, namely blowing. Indeed, if you don’t have good mastery of blowing, you aren’t going to be able to articulate well, play in tune, control dynamics or play with vibrato. All the blah, blah about embouchure is meaningless if you are not moving air through the embouchure into the flute. Technique is worthless without the air behind the fingers. Beginners – give me a kid with an enthusiastically windy sound any day over a kid that is timidly tweeting little peeps. It is much easier to help the first kid refine their sound and become more precise with how they direct their air than to get that shy kid who is barely making any sound to actually put some air into the instrument. Students who come to the flute from a piano background often have to be cajoled into blowing more. My conjecture about this is that they are used to thinking of the sound being generated by their finger technique. You need to help them understand their fingers make very little sound , but that their go juice on flute is the air stream. Hold off on teaching/expecting dynamics until you are sure the student has sufficient mastery of steady blowing to be able to understand the difference between air speed and air quantity. Getting to this point can take up to a couple years, depending on how much they play in band/practice on their own. Encourage your students to blow freely and refrain from using what my teacher, Tom Nyfenger, called the nay-palm, shushing your young flute players in the front row to hear the brass line behind them. The flutes are not impacting the balance of the ensemble they way you think they are. The reason they sound loud to you is they are sitting right under your baton. This is so incredibly damaging to developing young flute players. The truth is, a flute will never be able to compete in terms of volume of sound with most any other instrument in your ensemble, not a trumpet, a saxophone or even a clarinet. By shushing them and not instructing your flute players how to play more quietly, the kids develop all kinds of negative compensating behaviors such as pinching the aperture, squeezing in the throat, clenching their teeth and just not blowing. The consequence is that the flutes sound terrible and have horrendous intonation problems. These problems are then compounded if you then tell them to roll in or out to fix the pitch. All of these problems with evaporate if you encourage your students to blow in the first place. If your students know how to blow well, learning to play with vibrato, developing lively articulation and meaningful technique is part of a natural progression of acquiring skills. Good blowing and a steady, supported air column facilitate all these skills. You have to have the go juice first. Do you ever feel as if getting your flute section to play in tune is like herding cats? 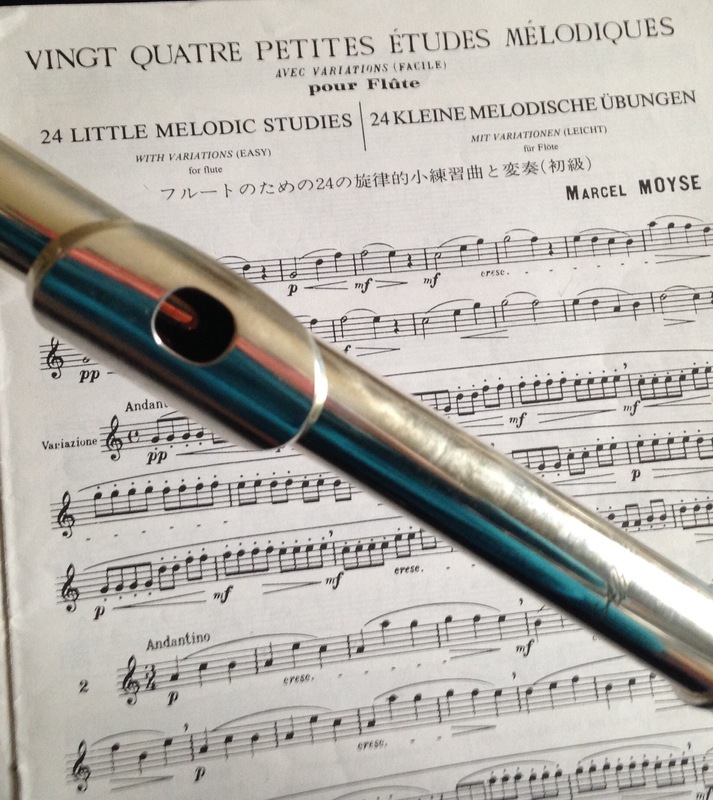 Have you ever told your flute students to roll the flute in or out to adjust the pitch? Me and my flute teaching colleagues are all holding our ears and crying, “Noooooo!” Why the extreme reaction, you might ask? The answer is because rolling in and out to change the pitch is a chewing gum/rubber band solution for the issues of pitch awareness. It really doesn’t address the underlying issues of embouchure formation and pitch awareness. The student might be more in tune for the moment, but they won’t really learn what “in tune” really means and rolling in/out has a really negative impact on tone quality. And the next time they play the same passage, you are back to where you started because it will be just as out of tune as it was before you asked them to roll in or out the first time. What are the tone problems caused by rolling in and out? If you roll in, you wind up covering the blow hole too much. This will make it flatter, but it also makes the tone dull, small, lifeless and impossible to play with any kind of dynamic range. If you roll out, the pitch will be somewhat sharper, but the tone will be thin, weak, won’t project and makes it impossible to play with any dynamic range. It is essential to understand that correcting pitch problems means correcting embouchure and placement issues. Embouchure flexibility, dynamic and pitch control are basically one issue. As developing flutists, we all have to learn consistency in where we put the flute on our bottom lip/chin and how we direct the air. The best place to put the flute is where you can get the most resonance from the flute. This is different for each person because of the endless variation in size of lips, teeth and oral cavity. The only way to achieve a good, in tune sound is through experimenting with blowing angle, how much to open or cover the blow hole and teaching students lip independence. When students are not energizing the air column sufficiently (supporting), you see all kinds of compensating behaviors including pulling corners, pinching the aperture, closing the throat, clenching the teeth. All these behaviors cause pitch problems. To raise the pitch, push the bottom lip forward to raise the airstream, while making sure the top lip is directing the air at the blowing edge. Be sure to blow with an energized air column (support) at every dynamic level. Stay relaxed in the throat, jaw, cheeks and use a focused air stream through the aperture in the lips. 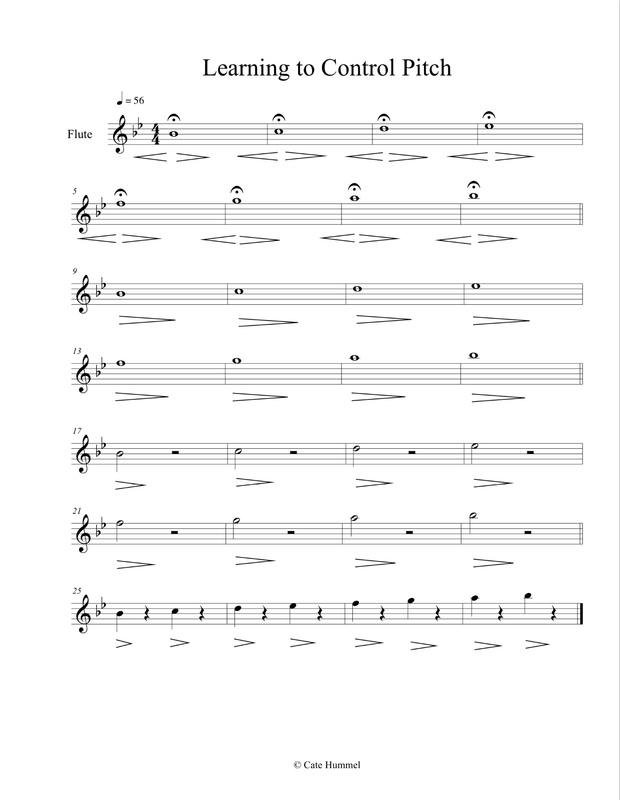 Try this exercise with your students individually and in sectionals. Use a tuner and maintain the pitch with crescendo and diminuendo using the guidelines above. When Do You Start Teaching Dynamics? The short answer to that question is, “It depends”. What does it depend on? It depends on a student’s ability to blow with a steady air stream and to differentiate between air speed and air quantity. Learning to differentiate between air speed and quantity takes time for the student and an understanding of sound pedagogy from the teachers who work with the student. When a kid starts on the flute, the first job is to learn to direct the air properly to hit the strike edge of the blow hole. Then they need to learn to change the blowing angle to play in the different registers. Often at this stage the student is blowing through a large aperture, expending a lot of air, huffing and puffing, making a fuzzy sound and having trouble sustaining anything longer than two or three beats. As they continue practicing, most of the time the student learns to blow through a smaller aperture, control their breath and make a clearer tone. Is this a good time to start introducing dynamics? I would say no, absolutely not and here is why. You can do more harm than good for your kids because they start trying to do what you are asking without having the skill set to play with dynamics correctly. Kids will pinch the aperture, which can make them play sharp. They start rolling the flute in and covering more. This will make the pitch flat. They try to control the air by squeezing their throats. Do you really want your students to sound like they are strangling? And they don’t really know anything about managing the air stream so they wind up trying to control the dynamics with their lips, tongue, throat, size of the oral cavity, etc. Kids are enormously creative in their solutions but the results for both pitch and tone can be devastating. And they wind up building in habits that they may never overcome. Never mind about dynamics for a least the first year to two years of playing. Teach them to blow with a steady, supported air stream always (using their abdominal muscles to drive the air). Teach them that the size of the aperture stays pretty much the same throughout the range of the flute. Show them that the air speed and air quantity are not the same thing. You can play very softly provided that the air column is moving quickly enough with enough pressure. Dynamics on flute are controlled by a steady air speed and varying the quantity of air, not with the embouchure. The embouchure’s job is merely to point the air in the correct direction. Think of a garden hose. The actual source of the water pressure is far from the nozzle. The nozzle directs the water wherever it is pointed. Your students will develop a wide palette of dynamic expression if you spend time helping them learn to control the air column in the first couple years of playing. It all comes down to how you manage the air.